Call it an open secret if you want. Every NSF (full time National Servicemen) knows that one of the benefits of serving in the military in Singapore is that you can have your wisdom teeth removed for free! Wisdom teeth removal will cost upwards of $800 if you decide to have it done in public hospital or with private dentists. If you have all 4 of your wisdom teeth removed whilst serving the nation, you stand to save upwards of $3000! What’s more, you will have one less thing to worry about in future. However, ever wondered where you can have your wisdom teeth removed? Or when? Or what is the process like? Fret no more! Welcome to the first ever, comprehensive and complete guide to wisdom teeth removal for NSFs! Carry on reading to find out more! Only full time NSFs are eligible. This means those that are currently in active service with the Singapore military (any branch - army, home team, air force, navy). You should also have your 11B (military identity card) with you whenever you go to the hospitals or public institutions. This is to facilitate easy claims and payment processes. You can have your wisdom teeth removed either in selected army camps or public institutions. If you choose to have your wisdom teeth removed at army camps, only certain camps (eg Nee Soon Camp, Kranji Camp, SAFTI) are equipped with the personnel and tools to carry out wisdom teeth surgery. Smaller camps may not have the equipment and you will need to be referred to these bigger camps. Where can I have NOT have it done at? Polyclinics. Polyclinics can only offer you referrals to public institutions.Your own private dentist. The NSF scheme doesn’t cover the cost if you have your teeth removed at a private practitioner. ALL procedures done dental centres in army camps are free of charge. Yes, you heard it correctly… all procedures! These includes simple extractions, surgical removal of wisdom teeth, fillings and even scaling. If you opt to have treatment done in public hospitals, only surgical removal of wisdom teeth is free and claimable under the SAF scheme. If you have fillings or scaling done at these public institutions, you will have to pay for them.What procedures are eligible and claimable at public hospitals? This may potentially get a bit tricky due to the combination of wisdom tooth issues an individual might have. Technically speaking, only wisdom tooth surgery is claimable under the scheme. That means it is free only if your wisdom tooth requires surgical removal. There are some cases where wisdom teeth do not need surgery to be removed. Click here to learn more about surgical vs non surgical removal of wisdom teeth. To summarise that article, impacted wisdom teeth require surgical removal. If, however, your wisdom teeth erupts normally, they do not require surgical removal. A simple extraction can be done. If, by chance, all your wisdom teeth can be removed without surgery, the NSF scheme does not cover this! You will have to pay for the procedure. Simple extractions together with surgical removal of wisdom teeth are claimable! Let’s say you have two lower impacted wisdom teeth and two upper normally erupting wisdom teeth (which is a pretty common scenario, by the way). Your X-ray will look something like this. 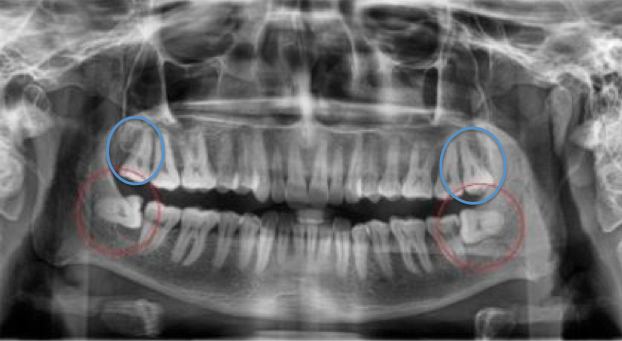 Circled in red are the impacted wisdom teeth. In blue are the upper wisdom teeth that are erupting normally. If you only decide to remove your upper wisdom teeth, you will have to pay for the procedure as these are deemed simple extractions. If you only decide to remove your lower impacted wisdom teeth, it is free because they have to be surgically removed. If, however, you decide to remove both your upper and lower wisdom teeth, it is free! Funny how the system works, but all the more better for you guys. For an individual with 2 impacted lower wisdom teeth and 2 normally erupting upper wisdom teeth, we usually remove the upper left and lower left wisdom teeth in one visit, and remove the remaining teeth in the next visit. In this way, the entire process is claimable and you do not have to pay for anything! Under local anesthesia (LA) or general anesthesia (GA)? Wisdom teeth can usually be removed under local anesthesia as they are a relatively minor procedure. This means that you will be awake for the duration of the procedure. In army camps, you can only undergo removal by local anaesthesia. This is because army camps do not have the facilities that hospitals do. Wisdom teeth can also be removed under General anesthesia. This means that you will be unconscious during the procedure. Removal under GA is usually reserved for complicated cases. However, remember that if you opt to undergo GA removal of your teeth, ALL your wisdom teeth will be removed during that visit. This is unlike LA removal, where you can opt to have your teeth removed sequentially over 2 visits. Click here to find out more about LA vs GA removal of wisdom teeth! How many days of MC do I get? What is the process of getting a referral to a public institution? The most important thing you need to note is that you need a referral letter before going to the public hospitals. If not, you will be treated as a private patient and you will have to pay for the procedure! Get a referral from your camp medical officer or dental officer. Tell them that you will want to remove your wisdom teeth. They will usually give you the choice of having it done at army camps or at public hospitals. If you want to have yours removed at public hospitals, they will print a referral for you. Dental FFIs are usually conducted in camps 2-3 months before ORD. During these FFIs, the camp Dental officer will do a dental examination for you and inform you if you have wisdom teeth and whether or not they should be removed. This is usually a good time to get a referral too. During your appointment, tell the DO that you want to remove your wisdom teeth. He or she will do a dental examination and X-rays may be taken. Once they have confirmed that your case is suitable, they will write a referral letter for you to any one of the public institutions of your choice. Do note that making a polyclinic appointment usually requires a rather long waiting time of a few months. In addition, there is also a waiting time from the time of referral to the point where you actually get seen in the public hospital. Hence, remember to plan your time and book early! Do not wait too close to your ORD date or you might miss the boat entirely. Remember, only active servicemen get to enjoy these benefits! Also, take note that you will have to pay for the consultation fee at the polyclinic when you see the dental officers. This is not covered by the NSF scheme. My wisdom teeth do not hurt. However they are impacted and partially erupted. Should I have them removed? Generally, yes. Impacted and partially erupted wisdom teeth usually causes problems down the line. 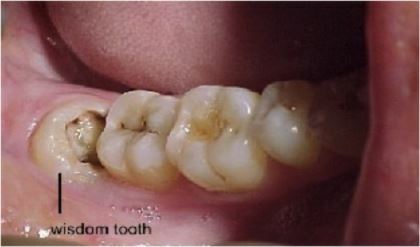 - The gums covering the wisdom tooth (called the operculum) tends to trap dirt and is difficult to wash out. Over the long term, the operculum tends to get inflamed and painful. - The impacted wisdom tooth traps dirt at the neighbouring tooth. This predisposes the neighbouring tooth to decay and toothache in future. As such, even if you do not feel pain now, there is a high likelihood that it will give you problems in the future. Since the cost is covered by MINDEF, why not get it done now and save yourself the headache later? As a serviceman nears his ORD date, many superiors will know and be prepared for his inevitable wisdom tooth surgery. However, it is good etiquette to inform the necessary people, and seek permission if need be, especially if you are electively removing your wisdom teeth (ie not causing you pain). As you will be on MC, plans may have to be made for your duties to be covered by someone else.